India and Britain on Wednesday condemned terrorism in all its forms and agreed to strengthen cooperation to take “decisive and concerted actions” against globally-proscribed terrorists and terror entities while naming Pakistan-based terror outfits following talks between Prime Ministers Narendra Modi of India and Theresa May of Britain. In a significant move, the two sides also agreed to work together for an open, inclusive and prosperous Indo-Pacific region. At the breakfast meeting between Modi and May at her 10 Downing Street residence, the two leaders discussed their shared priorities in the Indo-Pacific and committed to working more closely together to ensure it remained free and open. “They reflected on the progress made on bilateral defence and security cooperation since (May’s) visit to India in 2016 and the agreement on a number of defence capability partnerships in key strategic areas, with closer military-to-military ties underpinned by a succession of high level visits and exchanges,” a Downing Street spokesperson said. A joint statement issued following the meeting said the two leaders reiterated their strong condemnation of terrorism in all its forms, including terrorism and terror-related incidents in both India and Britain. “Both leaders also affirmed that terrorism cannot be justified on any grounds whatsoever it may be and it should not be associated with any religion, creed, nationality and ethnicity,” the statement said.. It said that both leaders agreed that terrorist and extremist organisations need to be denied space to radicalise, recruit and conduct attacks on innocent people; for this all countries need to work together to disrupt terrorist networks, their financing and movement of terrorists including foreign terrorists. “The leaders agreed to strengthen cooperation to take decisive and concerted actions against globally-proscribed terrorists and terror entities to protect our citizens, including Lashkar-e-Tayibba, Jaish-e-Mohammad, Hizb-ul-Mujahideen, Haqqani Network, Al Qaeda, ISIS (Islamic State) and their affiliates as well as tackling the online radicalisation and violent extremism which feeds this,” the statement said. It also said that a secure, free, open, inclusive and prosperous Indo-Pacific was in the interests of India, Britain and the international community. “The UK and India will also work together to tackle threats such as piracy, protect freedom of navigation and open access, and improve maritime domain awareness in the region,” it stated. This assumes significance given China’s aggression in the South China Sea and attempts to increase its footprints in the Indo-Pacific region. India, along with the US, Japan and Australia, recently revived a quad in the Indo-Pacific. At their meeting, Modi and May discussed the nerve attack on an ex-Soviet spy and his daughter in Britain and the chemical attack in Syria, “expressing concern and making clear their opposition to the use of chemical weapons by any party in any circumstances”. “In the wake of the appalling nerve agent attack in Salisbury, the UK and India have reiterated their shared interest in strengthening the disarmament and non-proliferation regimes against the spread and use of chemical weapons,” the joint statement said. In a bid to boost cooperation in technology, the two sides have agreed to a new UK-India Technology Partnership. “A UK-India Technology Partnership is central to our joint vision and to our prosperity, today and for our next generations,” the statement said. India has also welcomed Britain’s initiative of establishing a UK-India Tech Hub in India as part of the growing bilateral technology partnership, according to the statement. The Downing Street spokesperson also said that May updated Modi on the progress of Britain’s withdrawal from the European Union, “saying the implementation period agreed in March gives Indian companies and investors the confidence that market access will continue on current terms until the end of 2020”. 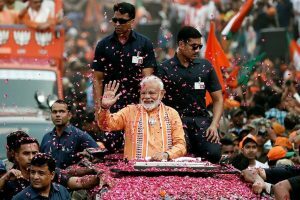 “Prime Minister Modi said there would be no dilution in the importance of the UK to India post-Brexit,” the spokesperson said. 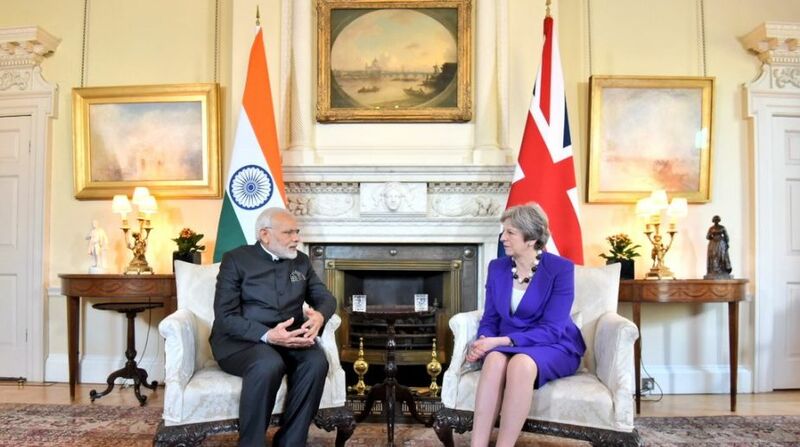 According to the joint statement, both leaders agreed to forge a dynamic new India-UK Trade Partnership, to develop new trading arrangements as Britain assumes responsibility for its independent trade policy, facilitate investment in both directions and intensify collaboration on shared or complementary strengths. On people-to-people ties, it said Britain welcomes the best and brightest from India to study and work, “especially in subjects and sectors that develop the skills and capabilities that will boost the prosperity of both our countries”. Both sides also agreed to work closely together and with other Commonwealth member-states to revive this grouping of ex-British colonies. “We are committed to reinvigorating the Commonwealth, especially ensuring its relevance to small and vulnerable states and to our youth, who make up 60 per cent of the Commonwealth’s population,” the joint statement said. Modi arrived here on Monday night from Sweden on the second leg of his three-nation tour of Europe which will also see him going to Germany. He will attend this year’s Commonwealth Heads of Government Meeting (CHOGM) here on April 19-20, becoming the first Indian Prime Minister to attend this biannual event since 2009.